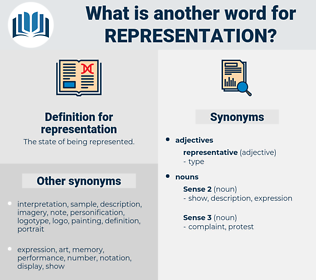 What is another word for representation? considerations, arguments, notes, sightings, officials, approaches, women, heads, representing, Representativeness, represent, representatives, represented, participation, representative, allocation, allocations, characterization, distribution, distributions, delegation, delegations, reflection. images, Missions, Proxies, plots, representatives. Fora, media, cross-section, representing, represent, represented, representivity, assertion, reproduction, participation, perception, illustration, allocation, expression, portrait, characterization, redistribution, distribution, protest, delegation, reflection, manifestation, portion, petition, exhibition, mapping, exposition. 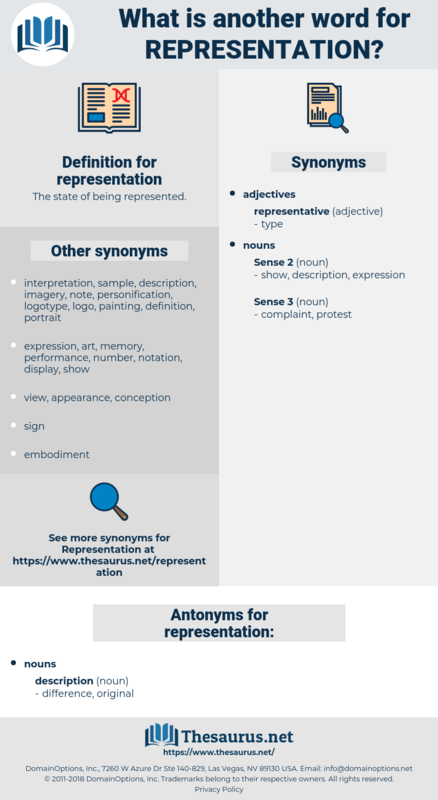 impersonation, presence, Representativeness, portrayal, voice, representative, balance, assistance, counsel. All the States of the American system now maintain diplomatic representation at this capital. In the first of these scenes we have a representation of five men attacking three lions. model, dramatization, proportional representation, dramatisation, modeling, pictorial representation, modelling, figuration, schematization, typification, pageant, schematisation, picturing, pageantry, diagramming. ecce homo, nomograph, photograph, cosmography, display, picture, objectification, model, icon, presentation, stage set, simulation, set, effigy, cutaway drawing, pieta, station of the cross, nomogram, ikon, document, pic, photo, adumbration, illustration, projection, map, image, creche, drawing, cutaway model, exposure, shade, copy, audiogram, simulacrum, rubbing, cutaway.